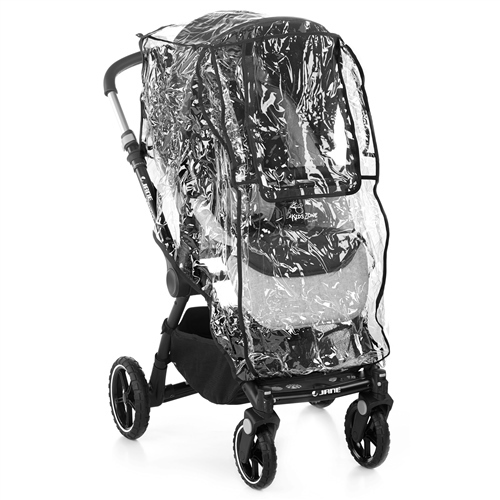 This raincover is a UNIVERSAL design and suitable for 3 or 4 wheeler pushchairs. It’s exclusively designed 'Roll up window' aids air circulation and prevents temperature build-up. It is easy to attach using Velcro fasteners and provides protection from the wind and rain. It’s suitable for most pushchairs which already have a fabric hood / frame, as this raincover has no frame it can be easily folded compactly away when not required. Compact design, easily folds away as it has no frame. Universal design so it is suitable for all pushchairs on the market which already have a fabric hood/frame to support it.Including forward and reversible facing pushchairs. Universal fitting - designed to fit any Pushchair which already has a hood to support it. This raincover fits my Joie brisk puschair and is 100% easier to put on then the original raincover that came with it. It use to be so time consuming with the original raincover and it's not bulky either!!! Excellent delivery service as arrived next day! Very good although would benefit with a guide as to how to fold back up so that it fits back in the bag, lol.